The percentage of Americans getting news from online and digital sources continues to grow, and that trend has been sustained in the last two years by an increase in the use of mobile devices. The explosive growth of social networking sites has been another contributor to the online search for news, with the percentage saying they saw news or news headlines on social networking sites the previous day increasing from 9% in 2010 to 19%. Many of the same trends also are evident in where people regularly get news. The percentage of Americans who regularly go online for news – those who get news online three days a week or more – has not increased. In the new survey, 46% say they get news online at least three days a week, which is unchanged since 2010. However, the percentage who regularly get news on a cell phone, tablet or other mobile device has nearly doubled since 2010, from 9% to 15%, and the number regularly seeing news on social network sites has almost tripled, from 7% to 20%. In the shifting online landscape, the use of mobile devices and social networking sites have replaced a traditional tool — search engines — as the driver of growth in finding news online. Search engines like Google, Bing or Yahoo continue to be the largest single tool in finding news online, but the substantial growth in their use between 2008 and 2010 has leveled off. Other online platforms have had less impact than social networking sites. Just more than one-in-ten (12%) regularly get news from reading blogs, a figure that has changed little since 2008. About the same percentage (13%) regularly gets news by email. Just 5% say they regularly get news by listening to podcasts. And just 3% of the general public regularly follows news on Twitter. About half (46%) of the public says they get news online three days a week or more, with about a third (32%) going online for news every day. Neither figure has changed much since 2010; in 2008, 37% said they went online for news at least three days a week and 25% got news online daily. There continue to be sizable age and educational differences in online news use. Nearly two-thirds of college graduates (65%) regularly get news online, compared with just 28% of those with no more than a high school education. Only about one-in-five (22%) of those 65 and older get online news regularly, by far the lowest percentage of any age group. 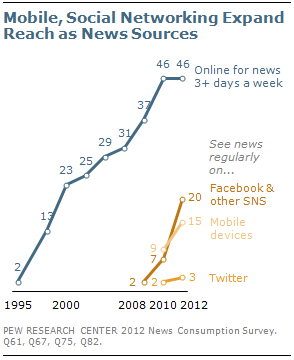 There has been little change since 2010 in the websites people go to most for news and information. Yahoo, mentioned by 26% of online news users, is the top destination, as it was two years ago, while 17% name Google or Google News, 14% CNN, 13% local news sources and 11% MSN. About one-in-ten online news users (9%) cite Fox as their top news destination. Nearly one-in-five Republicans (18%) name Fox as their top online news source, compared with 4% of Democrats and 8% of independents. By contrast, there are only slight partisan differences among those who mention MSNBC as the online source they use most often for news and information. In the current survey, 46% say they get news at least three days a week online or on a cell phone or mobile device; that is unchanged from 2010, when the question only asked about getting news online. However, an increasing percentage says they get news on a cell phone, tablet or other mobile device. 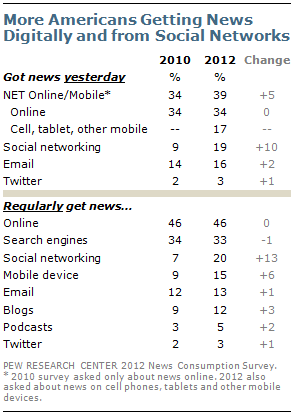 Currently, 15% say they regularly get news on one or more of these devices, up from 9% in 2010. In part, this is being driven by the increased internet availability on mobile devices. Two years ago, only about a third of the public (31%) said they accessed the internet on their cell phones. But today, more than half (55%) say they access the internet on a cell phone, tablet or another mobile device. The percentage regularly getting news from a social networking site, such as Facebook, Google Plus or LinkedIn, also has increased dramatically – from just 2% in 2008, to 7% in 2010 and 20% currently. These trends are complementary: Those who have smartphones – about half of the public (48%) – are far more likely to regularly see news or news headlines on social networking sites than those who do not (29% vs. 11%). Similarly, those who have iPads, Kindle Fires and other tablet computers (21% of the public) also are much more likely to get news from social networks than are those who do not own these devices. An increasing proportion of Americans say they regularly get news on a cell phone, tablet or other mobile device. But this growth has been driven mostly by the greater availability of mobile internet access. Mobile internet users themselves are no more likely to regularly get news on these devices than they were two years ago. 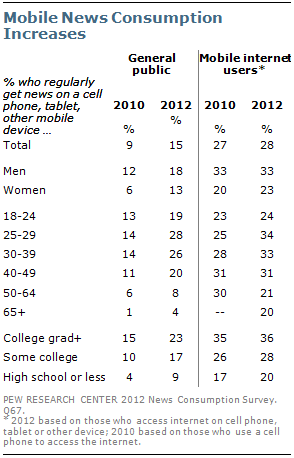 Among the public, 15% regularly get news on a cell phone or another mobile handheld device, up from 9% two years ago. About three-in-ten (28%) mobile internet users say they regularly get news from one of these devices, which is virtually unchanged from 2010 (27%). As news consumption on cell phones and other mobile devices has increased, so has the use of news apps, which allow people to access news and news headlines on their mobile devices. In the current survey, a quarter of all Americans, including 45% of mobile internet users, say they have ever downloaded a news app to their cell phone, tablet, or another mobile device. 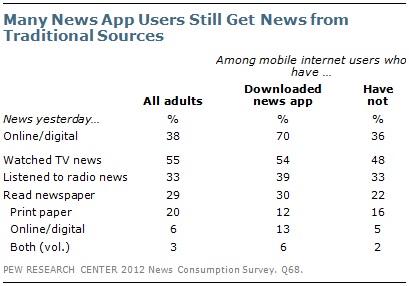 In 2010, 16% of the public, and only 20% of mobile internet users, said they had ever downloaded a news app. Those who have downloaded news apps tend to be young, well-educated and wealthy. More than four-in-ten (43%) of those with family incomes of $100,000 a year have ever downloaded a mobile news app; that compares with just 19% of those with incomes of $30,000 a year or less. Even among mobile internet users, there are sizable income differences: Fully 60% of mobile internet users with incomes of at least $100,000 have downloaded a news app, compared with 40% of those with incomes of $30,000 or less. Not surprisingly, those who have downloaded news apps are far more likely than other Americans to get news from digital sources. Fully 70% say they got news online or digitally yesterday. Yet they are not any less likely than others to get news from traditional sources. More than half (54%) of those who have downloaded news apps say they watched television news yesterday and 39% listened to radio news. Among all adults, 55% watched TV news and 33% listened to radio news. Comparable percentages of the public (29%) and those who have downloaded mobile news apps (30%) say they read a newspaper yesterday, but news app users are more likely to read the paper digitally and less likely to read a print version. The use of social networking sites such as Facebook, Google Plus or LinkedIn to get news and headlines owes in part to the substantial increase in use of social media in general by Americans. About four-in-ten (41%) of all adults say they had used a social networking site on the previous day, up from 30% in 2010, according to the Pew Internet & American Life Project. Yet those who go on social networking sites also are far more likely to see news on these sites. Overall, the percentage of all Americans who regularly get news from social network sites has roughly tripled – from 7% to 20% – since 2010. And the proportion of social networkers who regularly get news there has more than doubled, from 16% to 36%). Young people, who use social network sites at much higher rates than do older adults, increasingly use Facebook and other social network sites to get news. 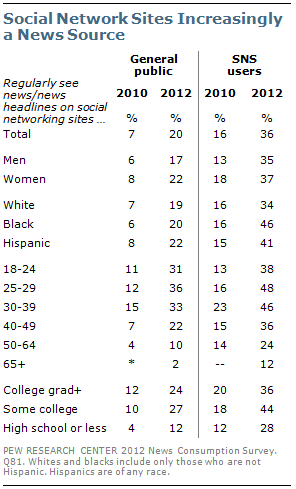 About a third or more of those ages 18 to 39 regularly see news or news headlines on social networking sites. Two years ago, fewer than one-in-five in younger age groups said they regularly got news on social networking sites. Far more Americans go on social networking sites than Twitter. Just 13% of adults say they ever use Twitter or read Twitter messages. And Twitter users are less likely to get news from the site than are social network users. Among the public, Twitter barely registers as a news source. Just 3% say they regularly get news on Twitter, while 4% sometimes get news there. Nonetheless, the percentage of Twitter users who get news on the site is growing. In the new survey, 27% say they get news regularly on Twitter while another 28% say they sometimes do this. 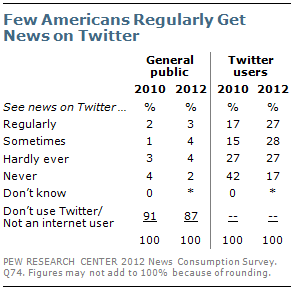 In 2010, only 17% said they regularly got news on Twitter, while 15% said they sometimes got news on Twitter. As is the case with social networks users, more Twitter users follow news on the site than use it to share news. About one-in-ten Twitter users (9%) regularly tweet or re-tweet news headlines; a similar percentage of social network users (10%) shares news on social network sites. Twitter users appear to be more closely connected to professional journalists and news organizations than their social networking counterparts when it comes to relying on them for online news. More than a third (36%) of those with Twitter accounts use them to follow news organizations or journalists. On social networking sites, 19% of users say they got information there from news organizations or journalists. For the most part, those who see political news on Twitter and social network sites prefer sources with no particular point of view. About half of those who get news on Twitter (52%), and 56% of those who get news on social networks, say they prefer news sources that do not have a particular point of view. 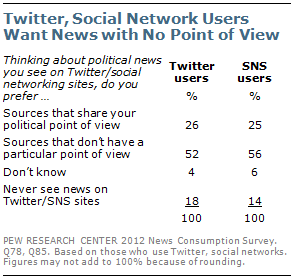 Just 26% of Twitter news users and 25% of those who get news from social networks would rather that these sources share their political point of view. There has been no growth in the past two years in the percentage of Americans that gets or shares news by email. Currently, 13% say they regularly get news by email, while 14% say they sometimes do this. 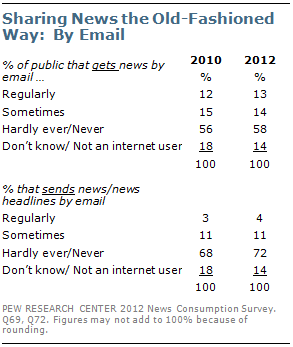 In 2010, 27% said they also regularly (12%) or sometimes (15%) got new or news headlines by email. Only 4% say they regularly use email to send news or news headlines; 11% say they sometimes do this. This also is little changed from 2010, when 3% regularly sent news stories by email and 11% said they sometimes did this. About one-in-ten Americans (12%) say they get news directly from news organizations by email. This figure also has shown little change since 2010 (10%). After a sharp increase from 2004 to 2010, the use of search engines like Google, Yahoo or Bing to find news has leveled off. After growing from 11% to 33% between 2004 and 2010, the number of adults who use search engines such as Google, Bing or Yahoo to search for news three or more days a week has steadied at 33%. The same leveling-off of search engines also has occurred among regular online news users. Just over four-in-ten (42%) say they used search engines to find news three times a week or more. Prior to that, the number of online news users who frequently turned to search engines had jumped from 19% in 2004 to 44% in 2010. There are few demographic differences when it comes to search engine use. As with other online news activity, older Americans and those with high school educations or less use search engines somewhat less than do younger people and college graduates. Slightly more than one-in-ten (12%) of all Americans regularly read blogs about politics or current events and another 21% say they read them sometimes. Just less than half (45%) never read blogs or do not use the internet. The numbers of those who read blogs regularly are little changed since 2008. There is little partisan difference when it comes to blog-reading: 14% of Republicans, 13% of Democrats and 10% of independents say they read blogs about politics and current events. Among age groups, regular blog reading is lowest among those 18 to 24 (6%) and highest among those 40 to 49 (17%). There is little difference in blog reading among the age groups in between. Looked at by education level, 15% of college graduates and those who have had some college regularly read blogs, a number that falls to 7% for those with high school or less.